With today’s announcement on the availability and support of the Columnstore indexes in the Preview version of Azure SQLDatabase, I am opening a new subseries in my Columnstore – Azure Columnstore. If you are interested in the basics of Columnstore Indexes, please visit the principal page for the series. 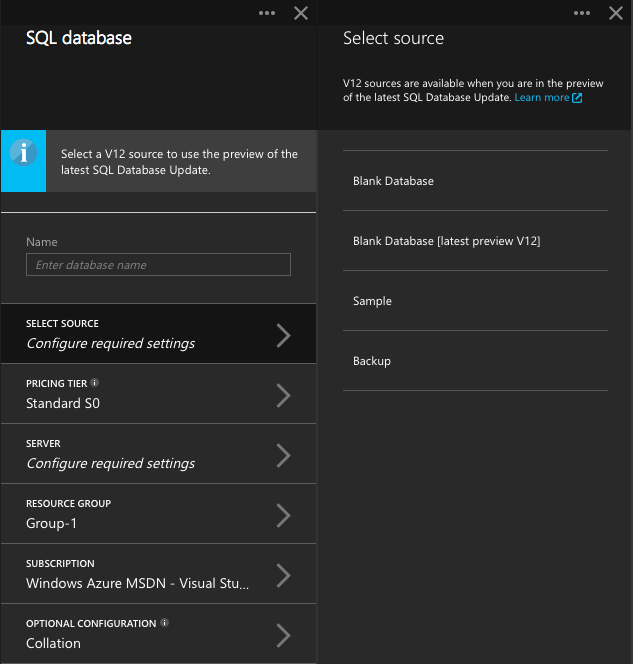 Today, on the 11th of December 2014, Microsoft has published a new Preview of the Azure SQLDatabase with a version 13.0.12 and which included support for the Columnstore Technology previously developed and used in SQL Server 2012 & 2014. If you are running a previous version of the Azure SQLDatabase, than you will need to upgrade it to the newest one, or maybe even create a new Azure SQL Database. ‘COLUMNSTORE’ is not supported in this version of SQL Server. -- Can we actually modify new column's metadata ? It has been executed perfectly, like I would expect from a good SQL Server 2014 installation. The statement failed. Column ‘c1’ has a data type that cannot participate in a columnstore index. Omit column ‘c1’. After 9 executions I had finally confirmed that there were no changes in the data type support from SQL Server 2014 RTM + CU4 (12.0.2402) to today’s preview version of Azure SQLDatabase. I thought that it was truly neat, but maybe creating a table with more than 8060 bytes would be allowed in this new version ? Creating or altering table ‘UnsupportedDatatypesTable’ failed because the minimum row size would be 9007, including 7 bytes of internal overhead. This exceeds the maximum allowable table row size of 8060 bytes. ‘MEMORY_OPTIMIZED=ON’ failed because it is not supported in the edition of this SQL Server instance ‘C082BEF6F57D’. See books online for more details on feature support in different SQL Server editions. I played for some time and the result of the first Row Group insertion was stable around 93-94 seconds in limited experience. The second batch process, that loads 7 times more the amounts of the information compared to the first batch, took 307 seconds on the first attempt and around 300 seconds on the secondary attempts. To my knowledge in SQL Server there is no status 4 for the Row Groups, nor the description Tombstone makes any sense for SQL Server 2014 architecture. If I am loading 8 Row Groups in total, then why do I have those objects that have no direct definition of the size? I could not understand what was going on, besides being quite sure that we have a new type of the Row Group that has some new functionality. I simply could not believe my eyes - the Tombstone Row Groups were there and they were not moving anywhere. The first result was showing that the reorganise operation with a hint were simply invoked, but somewhere after 5 minutes (automated Tuple Mover??? or simply an alpha-feature) my results became different and I have lost the only open Delta-Store and had just 8 compressed Row Groups and 8 Tombstones in my Clustered Columnstore Index. After some thoughts on the matter, I decided to search online for more information and to be sure enough in a matter of seconds I have found some information on Wikipedia on the Tombstone (aka Data Stone), and so Tombstone is a deleted record in a replica of a distributed data store, which makes me think that this structures will be used for some operations such as Merge of the different Row Groups or support of the Snapshot Isolation or maybe even having a distributed Columnstore inside an Availability Group (RAC InMemory type of thing). I mean those are all quite a speculations, with distributed Columnstore being by far the less possible thing. Anyway, having the number of Tombstones being equal to the number of RowGroups is most probably done to percolate the space for any of such future operations. And here we go - just 8 Compressed Row Groups were left without any Tombstones, which makes me believe at this point that Tombstone Row Groups are created and most probably are used by the Tuple Mover. The observed result shown no modification in Columnstore Index structure, besides naturally 50 rows being marked as deleted in Deleted Bitmap. At this point I decided to wait and see if the Tombstone Row Group will reappear... Sure enough less than 5 minutes later after rerunning my query I saw Tombstone Row Group coming back to town, which means that right now those structures appear only after the trickle load has been executed and a Delta-Store changed it's status from the Open to Close. As you can see on the picture with results, there are no Row Groups with segment_id 8 & 9, and so the Tombstone is definitively not a compressed RowGroup (at least for the moment). This is extremely interesting and it is definitely points to me that my Columnstore Queries library (expected to be published in the next 4-6 weeks) should be updated for the current Azure offering and for the future SQL Server versions. As already mentioned above, I have found a new Dynamic management view - sys.dm_db_column_store_row_group_operational_stats. It looks like it should serve for the operational needs of those who are using queries that reading information from this view. Detailed information on the locks & latches of different types are truly welcome, and being able to drill it down right to the concrete Row Group sounds like an amazing feature! Unfortunately at the moment none of my queries had provoked this view to show any kind of information and so I assume that it is very much under construction. Judging by the name of this view, it will be providing detailed information on the physical state of the Columnstore Indexes. The columns of this view are almost exact copy of the already existing DMV sys.column_store_row_groups with addition of the 2 new columns - trim_reason & trim_reason_description. I can only speculate about the reasons for copying out information of a complete DMV, but anyway those 2 new columns should provide information on the trim operation. Not being sure of what this trim might handle, I am interested in seeing more information before coming to any judgement. Anyway providing better information on the physical structure of the Columnstore Indexes will be more than welcome - there are enough areas such as Memory where these improvements should be applied. One of the key things to succeed while using the Columnstore Indexes is to make them execute in the Batch Mode, and so I decided to see if Azure SQLDatabase has any minimal support for it. - on Azure SQL Database both Columnstore Index scans are running in Batch Mode, while on SQL Server 2014 the m2 runs in row execution mode. Yes, we have the incredibly useful information on the number of Row Groups accessed and skipped !!! 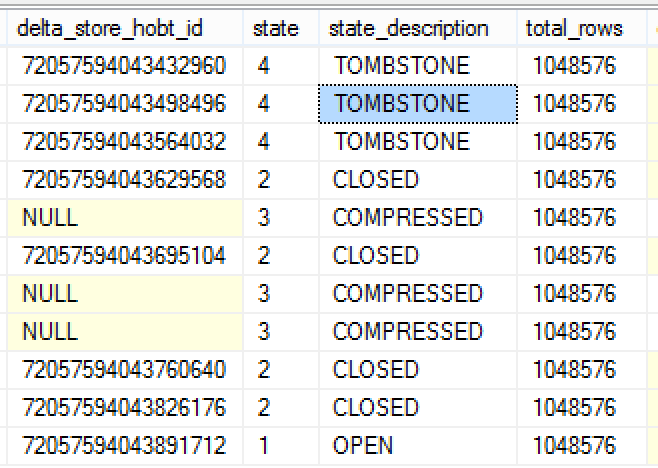 If you take a look at the meta information of our Columnstore Index Row Groups, you will see that we have 11 different Row Groups, where 1 of them is a Delta-Store, 1 is a Tombstone and 9 are Compressed. From here it is logical to understand that this information is provided only for the compressed Row Groups (others do not have the min & max values and so can't be skipped), and for the test query that I executed just 2 Compressed Row Groups were processed, while all other Compressed Row Groups were skipped. No more Trace Flags, no more ExtendedEvents for catching out this information! Amazing! Because this information is already contained in the execution plan, I have no doubt that one day they will be present in a graphical visualisation of execution plans. Important observation - it looks that the information about SegmentReads & SegmentSkips appears only if we are executing Columnstore Index scan in the Batch Mode, because if our query runs in Row Execution Mode, than this information is not available at all - at this point this might be simply a development preview version. The mystery of the Tombstone Row Groups was solved with the help of none the less than Sunil Agarwal (Principal Program Manager at Microsoft) who explained to me that the Tombstone Row Groups are actually the Delta-Stores that got compressed and needed to be removed by the Garbage Collector by the Tuple Mover. This means that if you wait long enough for the automated Tuple Mover to kick in, it should remove those Tombstone Row Groups. Does this mean that batch mode no longer requires parallelism? The last Azure query in this post (the loop join) ran in batch mode but was not parallel according to the picture. that’s the thing I would love to find out, I am expecting this to happen at one point. Regarding the Batch Mode, before going live with this blog post, I have decided to remove any speculation out of it – because at the moment the only thing that an execution plan on azure shows is just one RunTimeInformation element making it more difficult to determine how many cores are taking care in the process. Also, unfortunately no other information regarding DOP is present at the execution plan. I have tested queries with DOP=1 in order to see the results, and I have got the Batch Mode there, but since the execution times were similar I still can’t be sure that the Batch Mode runs in DOP = 1. I will blog about it soon. (1) look at property of the scan operator. like you found, that it shows BATCH. Also look at number of batches (if you see non-zero value, it is a further proof that the table was scanned in batches) and also number of execution (assume in your case, it shows 1 which implies single threaded execution). (2) you can look at sys.dm_os_schedulers and see how many visible non-DAC schedulers you have. I guess you have only 1. When you say that ‘execution’ times were similar, what were you comparing with? (2) I have checked on the sys.dm_os_schedulers and naturally as you said only 1 scheduler (besides DAC) is available – but if I remember correctly Multi-Threaded Parallel Index Rebuilds were also supposed to be in the current preview of SQLDatabase – or am I confused? Under similar execution times, I meant that running queries with MAXDOP = 1 or without results in comparable execution times.